A typical repaving vehicle used by VDOT contractors. The public is invited to a community meeting March 13 in the Mason Government Center on the Virginia Department of Transportation’s plans for road paving and restriping projects this year in Mason District. Road engineers and transportation planners from VDOT and the Fairfax County Department of Transportation will on hand to answer questions during an open house beginning at 7 p,m. The formal presentation will start at 7:15. The road work will start in April and conclude in November, Dozens of roads, mostly in the Lincolnia, Parklawn, and Lake Barcroft areas, will be affected. [A full list appears at the end of this post.] Community members are invited to give feedback on general traffic safety concerns but VDOT will not add other roads to the list. Exact work dates will be available about 10 days before the work starts, as contractors set schedules based on personnel and equipment availability. In subdivisions, “no parking” signs with precise information will be posted at least three business days before the work starts. Residents might be required to temporarily relocate cars, basketball hoops, and garbage cans. Crews typically work on neighborhood streets on weekdays from 9 a.m. to 3 p.m. Work on busier roads might occur overnight. Annandale – Braddock Road between Backlick Road and Little River Turnpike, Columbia Road, Four Year Run, Gallows Road (between Annandale Road and Columbia Pike), Glennbrook Road/Court, Little River Turnpike, and Medford Drive. Bailey’s Crossroads – Columbia Pike (between Carlin Spring Road and Lincolnia Road). Lake Barcroft/Falls Church – Barger Drive, Beachway Drive, Blair Road, Boat Dock Drive, Brooks Place/Glavis Road, Cavalier Corridor, Copa Court, Crosswoods Drive, Dearborn Drive, Duff Drive/Beachway Drive, Edgewater Drive, Fiddler’s Green, Georges Lane, Grass Hill Terrace, Greentree Drive, Half Moon Circle, Highview Place, Hillsborough Drive, Kerns Court, Kristina Ursula Court, Lily Dhu Lane/Kerns Road, Lyric Lane, Malbrook Drive, Mansfield Road, Old Farm Road/Farm Hill Drive, Pinetree Terrace, Potterton Drive, Prince Charles Court, Queen Anne Terrace, Randall Place, Ridgeway Terrace, Rustic Way Lane, Rutland Place, Sleepy Lane, Stonybrae Drive, Walters Woods Drive, Waterway Drive, Waterway Place, Wentworth Drive, Willow Tree Lane, and Woodville Drive. Lincolnia/Parklawn – Albro Lane, Ampthill Drive, Annandale Street, Applegarth Court, Arcadia Road, Autumn Cove Court, Beauregard Street (between Chambliss Street and Little River Turnpike), Berlee Drive, Brookside Drive, Bryce Road, Burnt Pine Court, Bushie Court, Chaco Road, Cherokee Avenue, Dakota Court, Chippewa Place, Chowan Avenue, Clinton Road, Conrad Road, Crater Place, Crestwood Drive, Dahill Place, Edgemoor Lane, Edwards Street, Eighth Street, Evangeline Lane, Everglades Drive/Yellowstone Drive, Fairfax Parkway, Fairland Street, Fairway Downs Court, Fifth Street, First Street, Fourth Street, Ginger Drive, Grafton Street, Green Spring Road, Guest Lane, Hawaii Court, Jewel Street, Joanne Drive, Kling Drive, Landess Street, Larstan Drive, Lassen Court, Lincoln Avenue, Lincolnia Road, Martin Street, Melvern Place, Merritt Road, Mesa Way/Ginger Drive, Montrolse Street, Morgan Street, Muir Place, N, Chambliss Street, Navaho Drive, Oak Ridge Drive, Oasis Drive, Olympic Way, Park Road, Parkhill Drive, Parramore Drive, Pima Street, Pine Lane, Redwing Drive, Ridgewood Road, River Downs Road, Rynex Drive, Second Street, Seminole Avenue, Sequoia Court, Seventh Street, Shawnee Road, Sixth Street, Spring Valley Drive, Stanby Court, Summpt Place, Tahoe Court, Teton Place, Third Street, Tonto Court, Twin Knolls Court, Vale Court, Vale Street, Vengo Court, Verde Court, Vicki Court, Virginia Street, Waverley Street, Yosemite Drive, Yuma Court, and Zion Court. Springfield – Anders Terrace, Blacksburg Road, Bostwick Drive, Canard Street, Cather Street, Charlottesville Road, Clifton Street, Colebrook Place, Commercial Drive, Dalton Road, Danville Street, Dublin Avenue, Edsall Road, Electronic Drive, Forman Court, Front Royal Road, Gainesville Road, Galax Court, Gilpin Drive, Hopewell Avenue, Independence Avenue, Industrial Drive/Road, Iron Place, Mitchell Street, Monroe Drive, Montgomery Street, New Hope Drive, and Tiros Drive. 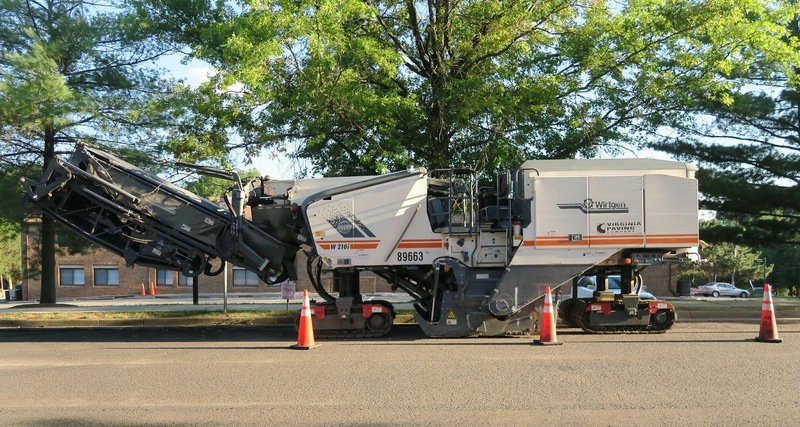 The Braddock District already had a community meeting on road repaving, Braddock District roads in the Annandale area scheduled for repaving this year include Little River Turnpike between Elizabeth Lane and Woodburn Road. So how do you at least get potholes fixed on a decrepit road since they aren't repaving it? I cannot believe how inept VDOT is. If you at their site and look for their interactive paving map, only the 2017 shows up. Someone should mention to them that we are 3 months into 2018! Calm down. It's only the title that needs updating, they've got 2018 plans on the interactive map. Are you certain? At least the links below the maps are titled 2017 and show almost all the roads for paving as shaded blue i.e. "completed". I have seen the patch quilt job VDOT did on Braddock that recently was paved and am concerned about its longevity. Its better than it was last month when it was littered with huge potholes but it looks really terrible. VDOT use to pave the entire road when it got bad. In case you can't tell from the people above, this is GREAT news. Looks more third world to me. But then Mason is third world. Do third world countries have paved roads.. I have never been to a third world county so I don't know. Asking for a friend. VDOT needs to crack down hard on those utility crews who seemingly cannot wait to begin digging up repaved roads. They've made an unholy mess of Sleepy Hollow Rd. Yes third world countries have paved roads that sort of look like the Baileys Crossroads area roads. This is great news unless you live in the immediate Bailey's Crossroads neighborhoods. Zero neighborhood roads will be getting paved in BC. Congrats to all the areas getting dozens and dozens of roads repaved. I'll take what I can get but the one road they are doing in Baileys is Columbia Pike and I dont think that stretch is that bad all. All of Annandale gets 8 small sections of streets paved...while our special communities that are non HOA get NADA. If your area isn't one that is scheduled to be paved, I sympathize but your comment really isn't accurate. The streets in Edsall Park - Blacksburg, Hopewell, New Hope, Dublin, Anders Terrace, Montgomery etc. - are not covered by a HOA and are scheduled to be repaved. If the intent was to say that somehow HOA areas get more attention, the argument falls short in this case. Normally, however, I would agree as it appears, at least anecdotally, that someone on the BoS always seems to throw the non-HOA areas of her district under the bus to be the "beneficiaries" of one of her "progressive" ideas.